The area surrounding the home of Krystina and Steven Schuler is difficult to characterize. It’s both rural and suburban. Set six miles outside Wilmington, Delaware, the residence is surrounded by both farms and cookie-cutter subdivisions. From a distance, the beautiful, highly sustainable home looks nondescript. It is so innocuous that some neighbors assumed it was a barn, and upon moving in two years ago, Steven would often accidentally drive by his own house. 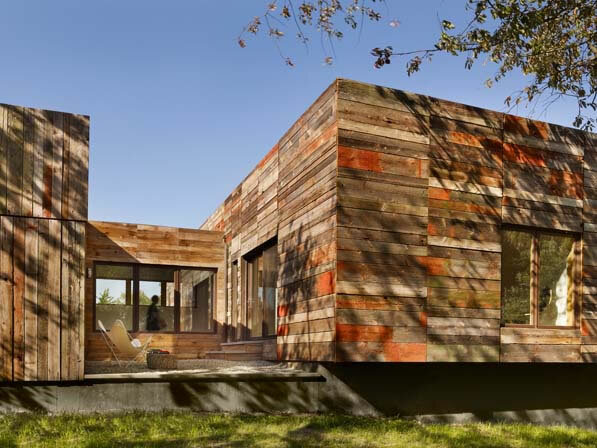 But the home, a perfect square covered in 100-year-old barn wood, is more dynamic than its façade lets on. The Schulers say they hated their previous home, located in the kind of indistinguishable development that dots the landscape near their new place. That house was poorly built and unattractive but what they could afford at the time. Once they were able to save enough money to move, they decided to start from scratch. They fortuitously stumbled upon a family selling the back two acres of its four-acre property. The young couple bought the undeveloped piece of land, knowing they wanted to build a sustainable home, and hired Philadelphia-based architecture firm Digsau to help them get the most for their money. Two unique elements—one invisible, the other highly visible—set the Schuler residence apart. The home’s exterior wood siding was taken from a local 100-year-old barn slated for demolition. The siding was used to construct a rainscreen with open joints circulating air around the planks. Beneath the wood is the other unique characteristic. For the home’s insulation, Digsau used Foamglas, an innovative material composed of a cellular glass that is impervious to wood-boring insects, has high compressive strength and excellent moisture resistance, and is completely fire-resistant. The Schuler residence is actually the first residential property in the United States to use Foamglas, which Pittsburgh Corning Corporation manufactures from sand and other natural materials to produce molten glass; when the powdered glass passes through a cellulating oven and is heated, it results in insulating blocks that can be trimmed and used as roof or wall insulation or fabricated into other shapes to fit around pipes. The lightweight, rigid insulation is also free of CFCs, HFCs, and HCFCs. Howard Patrick, Foamglas’s technical manager, says the insulation is almost exclusively used in industrial spaces here in the United States while the opposite is true in Europe, where many homes and buildings have been outfitted with Foamglas. “Foamglas was used quite a bit in roofing in the 1980s and ’90s, but as other insulation products emerged, it was used less and less,” Patrick says. Because of the product’s success in Europe and more people embracing sustainability in the United States, it’s experiencing a revival and being marketed toward residential buildings. “We predict it will become very popular in the housing market,” Patrick adds. Inside, the ranch-style, single-level home has an open floor plan that also can be converted to a more typical residential layout through a series of hidden pocket doors and surface-mounted barn doors. “Krys and I are anti-McMansion, both from an economic standpoint and from an environmental standpoint,” Steven says. “So while our new home is only 400 square feet larger than our old house, we use every bit of the space we have, unlike in our old house. It feels so much larger than it is.” Perhaps one of its most intelligent design elements is the use of sliding glass doors, which were installed as windows in order to maximize the connection to the exterior. Because of all the glass, portions of the house feel like a giant, screened-in porch, and on most days the home is soaked with natural daylight. Intelligently placed high-efficiency windows punctuate the rustic faÇade, providing views of the semi-rural property and allowing daylight into the home. The team packed the house with as many affordable green features as possible: cork flooring, low-VOC paints, and low-flow fixtures, which included outfitting two of their home’s three bathrooms with urinals, a request from Steven. Aside from being a quirky and unexpected addition, urinals are exceptional at conserving water; while the average toilet may use six or seven gallons per flush, the urinals installed in the Schuler home use just half a gallon per flush. The house also has a reflective thermoplastic-polyolefin (TPO) white roof to insulate and prevent solar heat gain and a dual-zone climate control system that allows the homeowners to turn off the HVAC system in the living area in order to only heat or cool the bedrooms at night.